Kansas college students are incurring a lot more debt to pay tuition and fees than they were a decade ago, but media reports laying the blame on the Legislature failed to examine all the facts, according to Dave Trabert, Kansas Policy Institute President. Two McClatchy papers, the Wichita Eagle and Kansas City Star, told an emotional story of a student selling plasma to help fund tuition and spoke to several people critical of the state’s role in funding higher education. The data they cited may be accurate, but it was a snapshot provided by the Board of Regents and no one was interviewed to add perspective that’s counter to those criticizing the legislature for tuition increases. The story suggests tuition increases in the last few years are due to the state legislature providing less funding to to colleges. “This is one-sided reporting, pushing a narrative and covering up the biggest problem,” Trabert said. Data from Governor’s Budget Reports collected by KPI shows state funding for the six major Regents universities is $418 million this year, or 2.7 percent more than provided in FY 2002. Inflation for Midwest Cities over that same period was 35.5 percent, so in order to keep up with inflation and account for slower-growing state aid, tuition and fees would have increased by 68.4 percent according to KPI. The adjacent table shows tuition and fees increased much more, however. Fort Hays State University has the smallest increase of 130 percent and Emporia State has the next smallest increase at 186 percent. 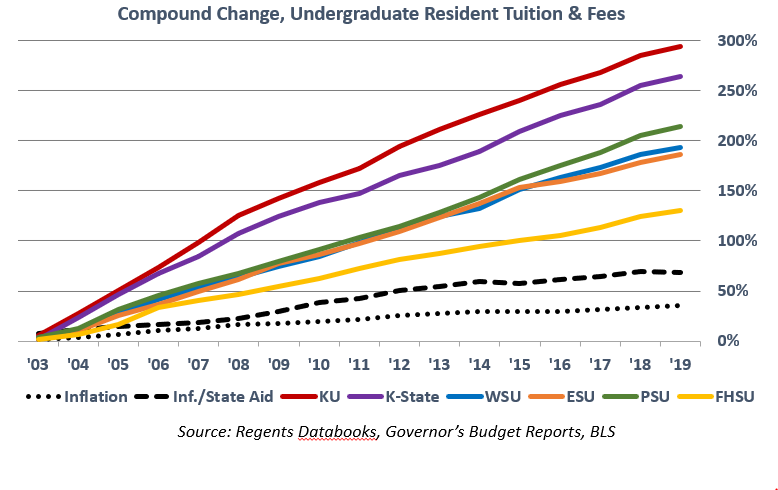 Wichita State hiked tuition and fees by 193 percent, Pittsburg State jumped 214 percent, prices at Kansas State went up 265 percent and the University of Kansas almost quadrupled tuition and fees, with an increase of 294 percent. Trabert says it’s fair to say the rate of growth in state funding is responsible for tutition increases between inflation (the dotted black line on the chart he provided below) and 68 percent (the big dashed line), but everything above 68 percent is due to choices made by university administrators and the Regents. The disparity in tuition charged and the comparative rates of tuition increases may be related to wide spending variances among the six major universities. The adjacent table reflects per-student spending on what the Regents define as educational spending, which includes costs for instruction, academic support and student services. The cost of administration, phyiscal plant, research, scholarships, athletics and other expenditures are not included. 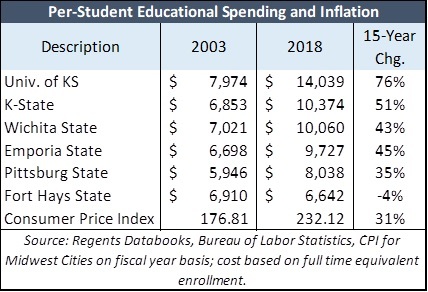 The University of Kansas has the largest cost increase over the last fifteen years (76 percent versus inflation of 31 percent) and also has the highest cost per-student, at $14,039; KU spends 35 percent more per-student than K-State, which is the next highest cost per-student. K-State’s costs went up 51 percent over the last fifteen years, followed closely by Emporia State (45 percent) and Wichita State (43 percent). Pittsburg State increased education spending by 35 percent and Fort Hays State reduced per-student costs by 4 percent. The Eagle story notes some of the Regents universities are cutting costs. KU cut costs by 6 percent, but increased tuition by 2.8 percent last year. KU’s proposed budget for next year increases tuition by another 2 percent. In the meantime, the Kansas Board of Regents, the governing body of Kansas public universities, requested $50 million in new funding from the state legislature. Gov. Laura Kelly’s budget seeks to add $9 million. Spending and tuition data used in this story is just for the six listed universities and does not include the KU Medical Center, the K-State Veterinarian school or any other entities, including the Board of Regents.